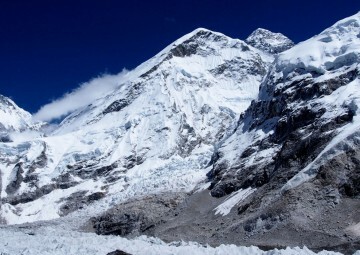 Everest High Pass Trek is one of the longest treks in the Khumbu region. The Everest High Pass Trekking is popularly known differently as “Everest Three Pass Trekking”, Everest Transverse Trekking” as well. Everest High Pass Trekking is one of the most exciting and adventurous trek that takes you through the renowned enduring passes of Kongma La (5,535m) approx, Cho-La (5,400m) approx, Renjo La (5,300m) approx, along with the classical route adding significance to this trail. The Everest High Pass Trekking is an ultimate trekking destination for individuals who dare to test their stamina and endurance to the limits. Everest High Pass Trekking is a true adventure personified program providing an opportunity to visit the Everest Base Camp, Kala Patthar, Gokyo Valley, shimmering blue lakes and astounding view points of the Gokyo RI, also has the potential of introducing a remote and untouched Nangpa La valley, the Sherpa village of Marlung, the village of Thame as well as other major and remote scattered sherpa villages and other valleys. The three high passes are all significant and presents with the towering mountainous views, but the excitement and vantage point which one gets from the Kongma La and Renjo La is thoroughly majestic and enchanting. 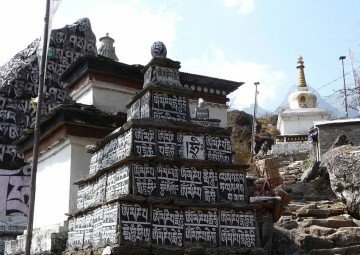 Everest High Pass Trek journey begins with sightseeing in Kathmandu with brief exploration of temples and various other monumental places of interests along with shops and restaurants. The following day we board a flight for a stimulating journey to the Lukla Airport. After few moments of regrouping we head straight towards the Sagarmatha National Park along the source of the milky Dudh Kosi River, colorful landscapes, forests, gompas and monasteries in the land engulfed by the towering peaks. From hereon we proceed towards Chhukung leaving the trail of Dingboche behind and acclimatize to visit Chhukung RI and set out to attempt the Kongma La Pass. Stepping on to this spectacular summit of Kongma La, we reconcile our way to the Everest Base Camp, stunned admirably by the stunning ice-fall hurling its way tumbling through the Western cwm. A trek to the viewpoint of Kala Patthar is followed by a tough climb through Cho-La Pass that finally leads us to the turquoise blue lakes of Gokyo. After enjoying sublime views of the Gokyo RI reminds us to move on to the next great pass the Renjo La. Spending a night in Marlung we follow a little of the route used for centuries by the Tibetan traders via Nangpa La to the village of Thame. Following the classical route we drop down to Lukla achieving our high pass trek and feeling satisfied and treasuring the moments fly back to Kathmandu. Everest High Pass Trek is a wonderstruck thrilling adventure providing an extraordinary glimpse of the entire region. A guaranteed trekking program to, quench the wanderlust of even the most intrepid adventurers. A strenuous and difficult trekking trail for physically fit possessing the technical abilities combined with altitudinal experience gives an edge while attempting this trekking adventure. Mountain Tiger Nepal provides you with an appealing encounter with one of the highest passes on earth to test your limits and remember this event forever and pass it on to the next generation as well. Day 1 Day 01:Arrival in Kathmandu. Overnight at hotel in Kathmandu. Day 2 Day 02: Fly from Kathmandu to Lukla (2880m) and trek to Phakding (2743m). Overnight at Tea house/Lodge. Day 3 Day 03: Trek from Phakding to Namche (3445m). Overnight at Tea house/Lodge. After breakfast, we start a walk to Namche Bazaar first thing in the morning. At about half-way up the hill, a gap in the trees allows us to spy Everest for the first time. 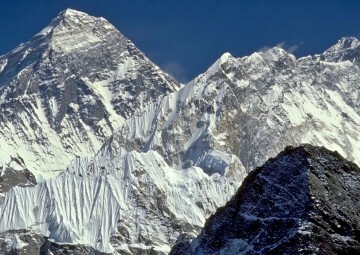 If the weather is clear the top of the South-West Face will be just visible behind the long Lhotse-Nuptse ridge. A plume can often be seen stretching away from the very summit. 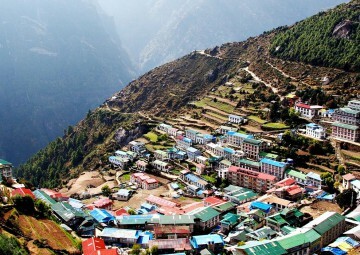 Namche is the most prosperous and the largest town in the Khumbu. A bazaar is held here every Saturday. The wares on display include meat, grains, and vegetables, tennis shoes and trinkets as well as hand woven aprons and Tibetan boots. The Sherpas play host to trader from the foothills, as well as Tibetans from over the border. Thamserku (6648m), Kwangde Ri (6187m) and Khumbila (5707m) surround the natural bowl that Namche sits in. Day 4 Day 04: Rest/acclimatisation day at Namche. Overnight at Tea house/Lodge. We take the day off to allow our bodies to adjust to the rarefied atmosphere before ascending to higher altitudes. The secret of safe acclimatisation is to ‘climb high, sleep low’ so it is safe for the more energetic amongst us to hike up the hill behind Namche to the airstrip at Syangboche, or stroll across to the museum behind the police post. Others may prefer to ‘chill out’ and visit one of the lodges for a freshly-baked cinnamon roll. Namche is a busy and bustling trading place and there is always plenty going on. After our day off we traverse west, enjoying marvellous view of Kwangde Ri and the waterfalls that cascade off its flanks. The trail stay high up on the bank of the Bhote Khose, and we wander through a yellow and white rhododendron forest that comes into full bloom in May. As we cross the river, we look back down the valley for beautiful views of Thamserku and Kusum Kangru (6369m), before ascending through more rhododendron forest to pasture lands in front of Thame. This is the birth place of Tenzing Norgay, the Sherpa who made the first ascent of Everest with Hillary in 1953. We night hult in meadows at the edge of the village. The hour-long climb to the cliff side monastery is well worth the effort. From this point, trekkers can skirt above the village to climb across the ridge in order to view the route to the Nangpa La, a pass to Tibet frequently used by the Sherpas and their yaks during the monsoon. After breakfast at the lodge, an easy walk to Marlung through the Bhote Koshi River where you can have short break. Then the trail leads uphill to Lumde through the dry valley. It is an interesting walking with enjoying the views of the snow peaked mountains and the valley. Today you won’t see Sherpa village because Thame is the last village of the valley. Once you get in to the village, hike a bit higher than the place where lodge is located to get acclimatize. Approx 4-5 hours trek. This is an easy day but we suggest you to start early because you will have to walk through the Glacier which is the longest glacier of Nepal called Ngozumpa glacier. By the time of crossing this glacier you will hear many sounds of the rock falling in to the small glacier lake. There are many rocks on the way which has ice underneath. During the sunny day ice melts pretty fast so we should cross this glacier before the sun gets strong. Once you get in to the Thaknak, better to climb up to the small hill for acclimatize. Approx 3-4 hours trek. This is a day which will fulfil your dreams to visit the base camp of the highest peak in the earth. 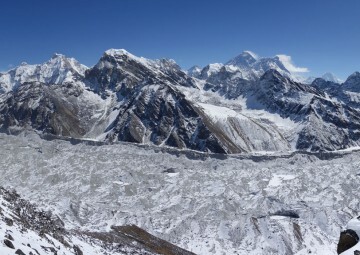 It is 3 hour walk through the ridge of the Khumbu glacier. You will enjoy the surrounding views of the glacier and mountains. There are Buddhist prayer flags which are the symbol of the Base Camp. During the climbing season there will be many tends with colourful looking around. After exploring around, trek down to the lodge and remaining of the day chill out at the lodge. Approx 6-7 hours trek. Today you will have to start your day without breakfast in the morning which is 2 hour hike up to the Kalapatthar, the greatest view point of the Mt. Everest, Mt. Nuptse, Mt. Pumori , Mt. Amadablam, Mt. Thamerserku, Mera Peak and many more. 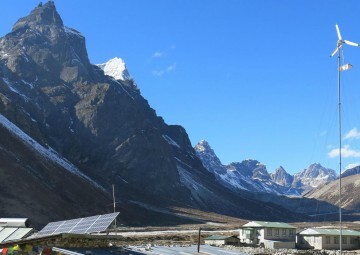 After taking many photographs, trek down to the lodge at Gorekshep for breakfast and continue your walk down to Lobuche. Approx 6-7 hours trek. After breakfast at the lodge, your day will start walking through Khumbu glacier towards east. After crossing the glacier and river the trail leads up to the pass which is the highest pass of this trip. There will be no tea shop and water resource so that you will have to carry few bottles of water to drink. After hard climb to the top, the trail drops steep down to the Chukung valley where your day ends. Approx 6-7 hours trek. Day 15 Day 15:Trek from Kongma la Pass to Tengboche ( 3867m). Overnight at Tea house/ Lodge. Day 18 Day 18: Fly from Lukla to Kathmandu. Overnight at Hotel in Kathmandu. After breakfast fly back to Kathmandu to Lukla. Day on your own.Evening enjoy with the dinner at typical Nepali restaurant with Cultural performances. Day 19 Day 19: Final Departure. Three times meals (breakfast, lunch, and dinner) during the trek. 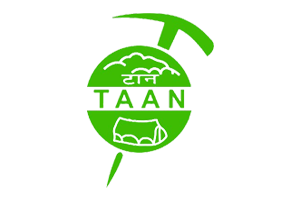 All personal nature expenses, bar bills, laundry, tips, lunch and dinner at Kathmandu, airfare etc. 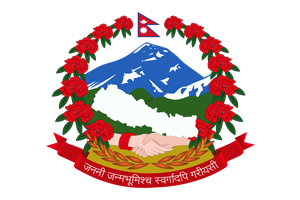 The extra airfare to travel from Kathmandu to Lukla to Kathmandu is USD 332 per person which is subject to change without the prior notice by the airlines.